How Healthy is Your Use of the Computer? Compiled By June Praet. 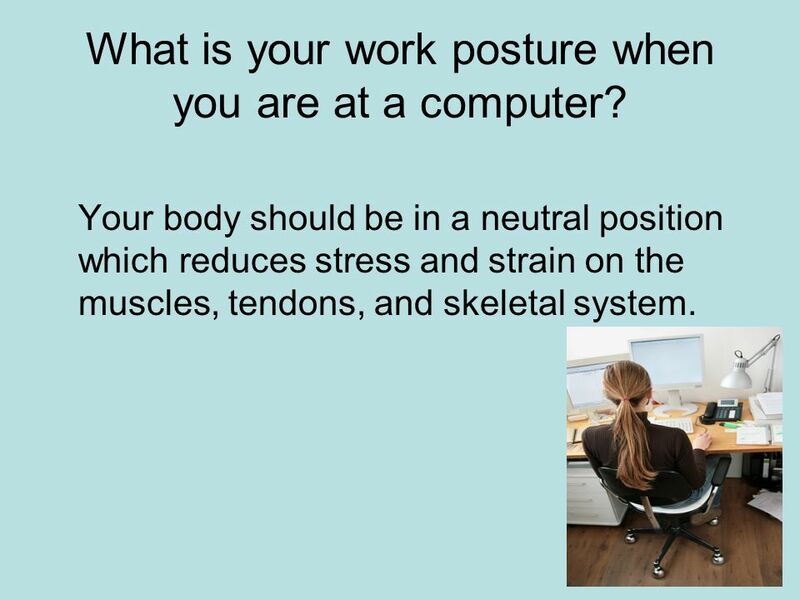 2 What is your work posture when you are at a computer? Your body should be in a neutral position which reduces stress and strain on the muscles, tendons, and skeletal system. 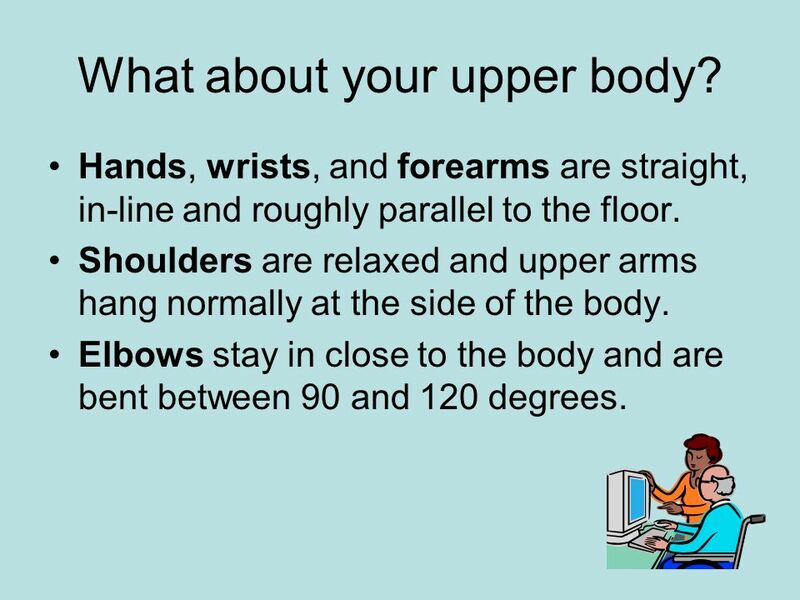 3 What about your upper body? Hands, wrists, and forearms are straight, in-line and roughly parallel to the floor. Shoulders are relaxed and upper arms hang normally at the side of the body. Elbows stay in close to the body and are bent between 90 and 120 degrees. 4 What about the Head? 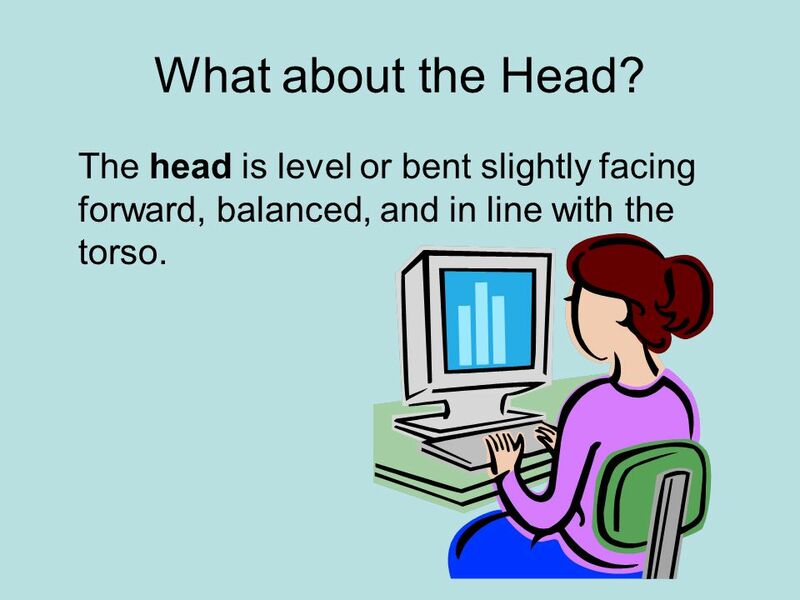 The head is level or bent slightly facing forward, balanced, and in line with the torso. 5 What about the Thighs, Hips, and Knees? Thighs and hips are supported by a well- padded seat and generally parallel to the floor. Knees are about the same height as the hips with the feet slightly forward. 6 How about your Feet and Back? 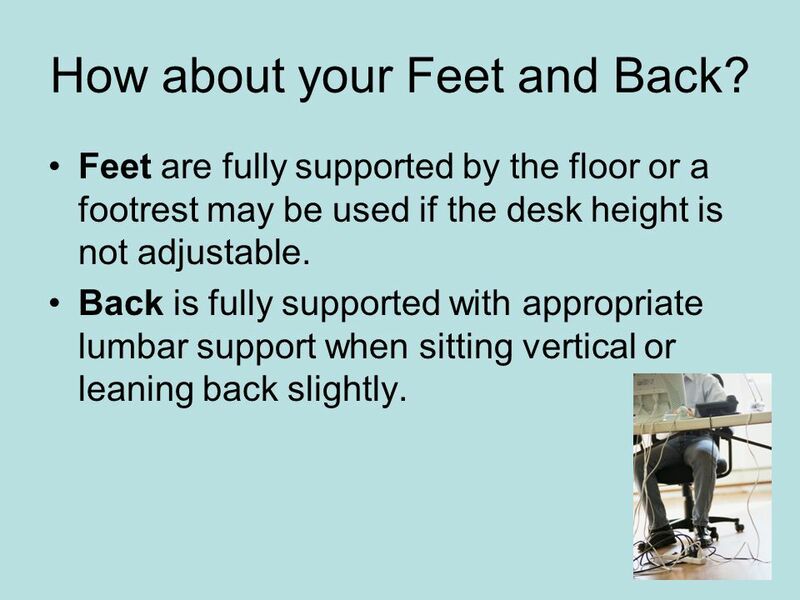 Feet are fully supported by the floor or a footrest may be used if the desk height is not adjustable. Back is fully supported with appropriate lumbar support when sitting vertical or leaning back slightly. 7 Sitting too long? 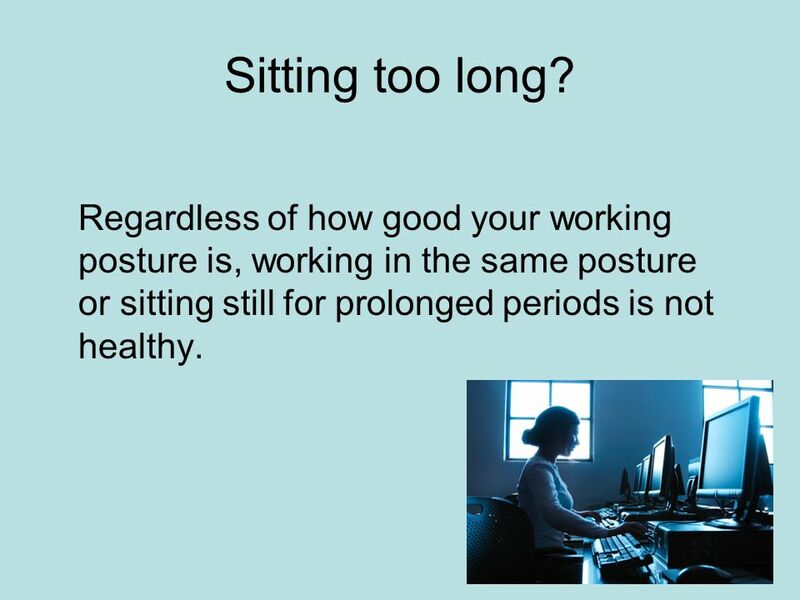 Regardless of how good your working posture is, working in the same posture or sitting still for prolonged periods is not healthy. 8 What should I do? 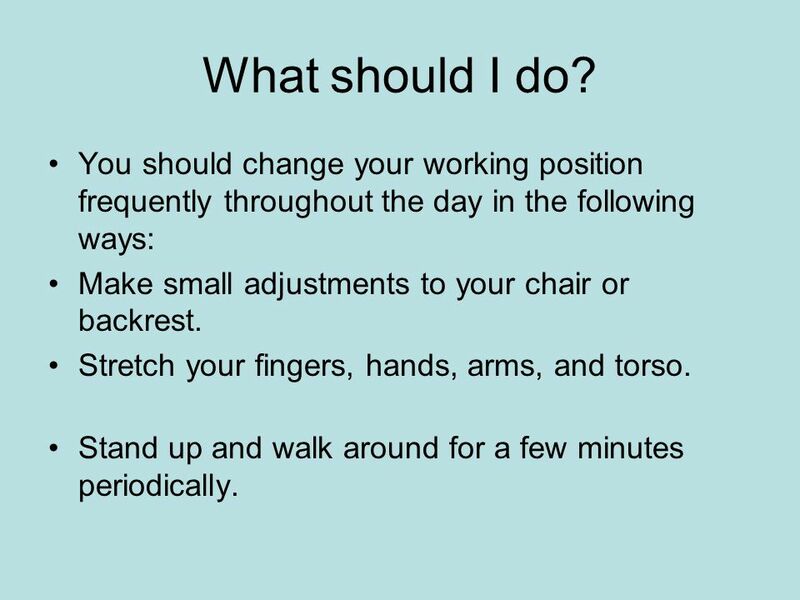 You should change your working position frequently throughout the day in the following ways: Make small adjustments to your chair or backrest. Stretch your fingers, hands, arms, and torso. Stand up and walk around for a few minutes periodically. 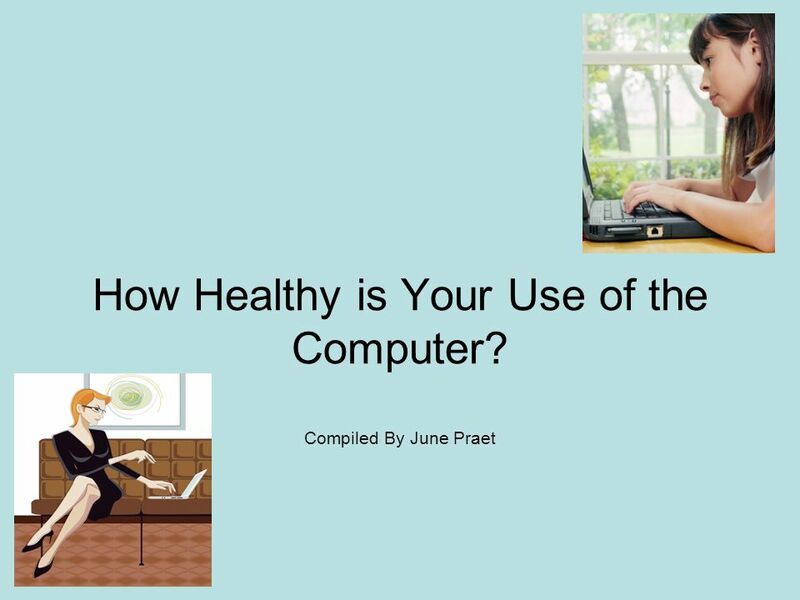 Download ppt "How Healthy is Your Use of the Computer? Compiled By June Praet." All About Stretching Going for the 3 Increases: Increase in Health, Increase in Happiness & Increase in Energy Strategies for Success in Weight Management. ERGONOMICS BETTER HEALTH IN COMPUTER TECHNOLOGY. School Workstations School computer workstations are designed to accommodate average size middle school. REVIEWING POSTURE Remember To:. Center your body in front of the ____ and ____ keys. Help for a Healthy Back Get Moving Kentucky! Moving for Health Lesson Series The development of the HEEL program was made possible by Senator Mitch McConnell. SAFETY TIPS IN COMPUTER USE. 1 SAFETY TIPS IN COMPUTER USE. 2 Agenda of the Talk Importance of Computer Symptoms. Causes of Symptoms The incorrect and correct body positions during. WellGOnomics How We Move Matters. What you do affects how you feel. Lecture # 5 Body Landmarks.  When measuring the body for apparel design and production, it is necessary to have a few key points for which to measure. General Office Ergonomics VDT’s Chairs Workstation. 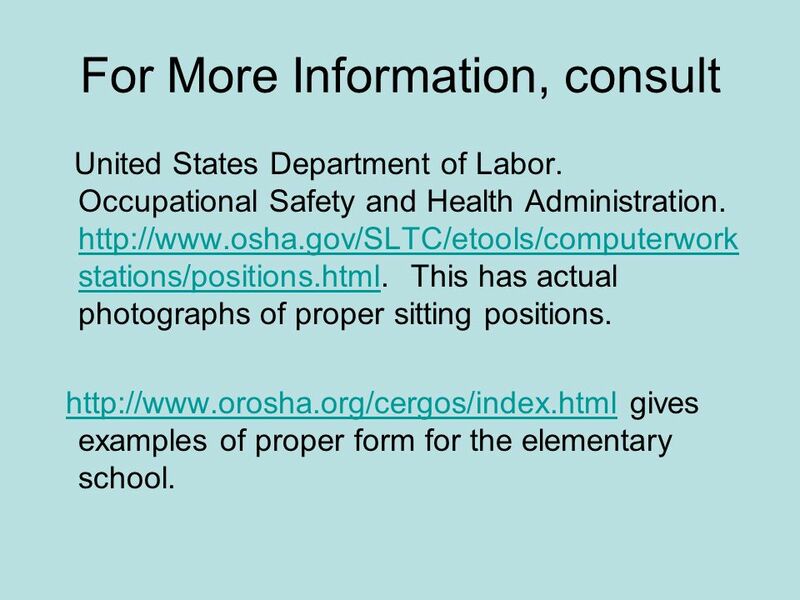 Safety at your workstation. What is an ergonomic workstation? ‘ Ergonomic’ means setting up the work environment to suit individuals. Making the environment.